Superfoods are since the invention of Soylent all the rage, and I have been fascinated by them since I read about them. 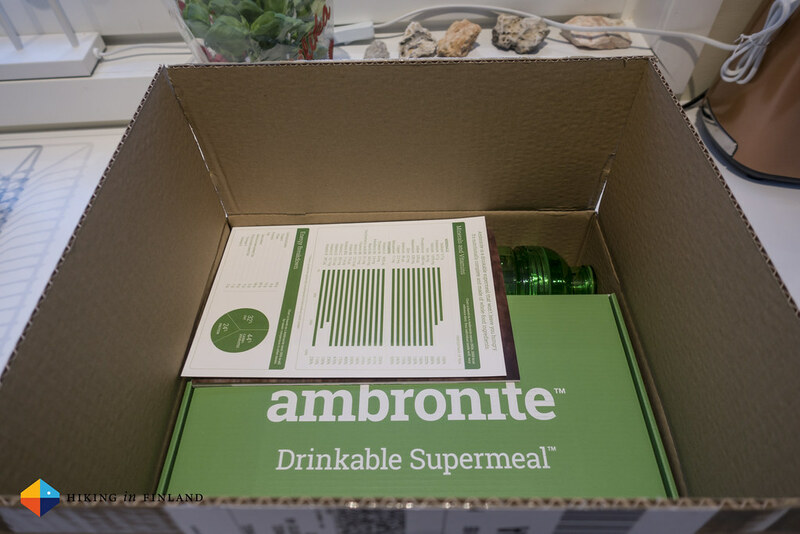 When Ambronite asked me if I’d like to test their all-natural, Vegan Supermeal I said yes and decided to have a wee experiment with it: Living only on Ambronite for a week. This is my journey into the world of superfoods. Soylent and it’s copies Joylent, Jake, Huel and Mana are the Food Revolution. Made for busy office workers who want to work more and not needing to go out to shop, cook, and clean the dishes these meals want to give you more time to pursue the things you like to do - be it working, partying or hiking. The idea did appeal to me since I read about Soylent, so it was easy enough to agree to test Ambronite. 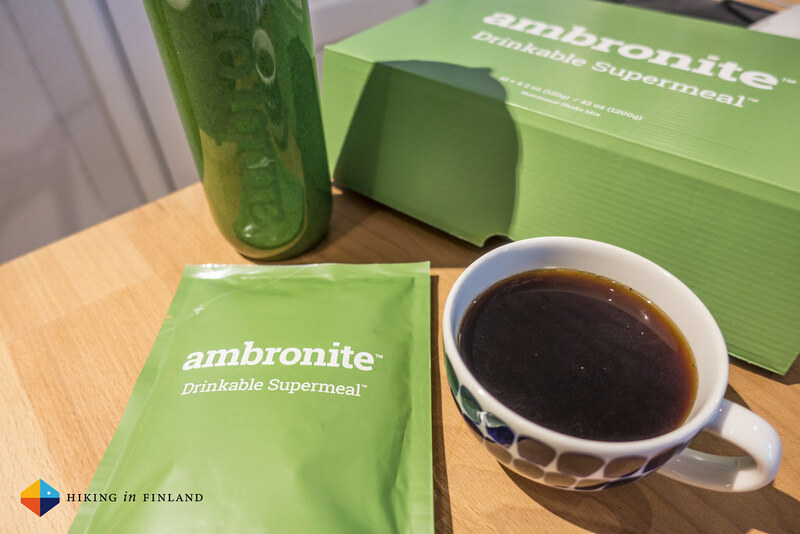 The Start-up from Finland has a Twist on their Supermeal, though: It’s only made from natural ingredients - there’s no chemicals or artificial ingredients in it, only good things from nature. That’s very appealing, but is also represented in their price - they are easily the most expensive option of those named. But as I normally already pay a premium for local & organic food, this would not be a big thing for me - plus I like to support Finnish Start-ups! My usual diet is 95% Vegetarian (we eat meat & fish once every other week). I usually eat a slice of bread or two with cheese and some veggies for breakfast, together with a cup of coffee and water. At Lunch we eat the leftovers from the previous day, afternoon coffee is the 2nd cup of coffee & some pastry or fruit. Around 17 o’clock I might or might not eat a snack (fruit or bread) and around 19 o’clock we have dinner together. In the evening while watching a series we eat some more fruits. My wife and me cook each two days in a row, then it’s the other’s turn. It’s a system that works well for us, and I normally don’t spend more than an hour in the kitchen in the evenings to prepare food and less than an hour shopping the day before my turn. So all in all I might spend a maximum of 1,5 hours grocery shopping and 3,5 hours cooking in the evenings, with maybe an hour of cleaning the kitchen. Six hours a week - six hours which I now could use for something else. If that is worth it for you to forgo real food - only you yourself can know, and at the end of the article you can order a free pouch of Ambronite and safe time & gain convenince (or lose out on a tasty lunch). The Outdoor Aspect of Ambronite comes in when looking at the numbers: A pouch weighs 126 g (120 g powder), has 500 kcal a portion and a massive load of Vitamins and Minerals. 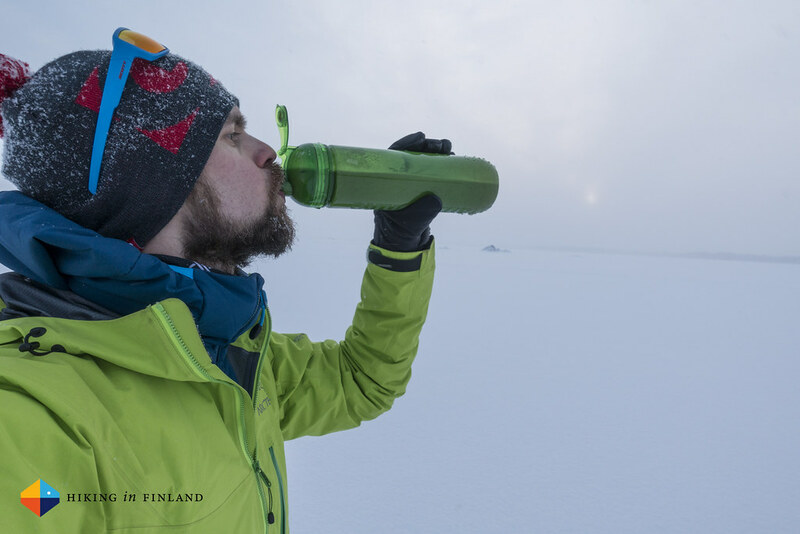 It is easy to prepare in the included bottle - add water & powder, shake, drink - and it should be possible to prepare it in a 1l Nalgene. The cheapest option is to subscribe to Ambronite, then a meal will be 7,60€ - a one-off package of ten will make your wallet 89€ lighter (or 8,90€ per meal). I can see it be useful as breakfast or lunch, especially if you have set yourself a long distance to hike and don’t want to stop to eat. Ambronite can be prepared and eaten on the go, and washing the dishes is as easy as rinsing the bottle - all very convenient. Because of the high amount of Vitamins and Minerals it also could help to keep you healthy on a long tour - but normal Vitamin-pills can that too. I would not go outdoors backpacking or ski-touring and eat only Ambronite. The weight to Calorie Ratio isn’t that good, plus it would be very expensive. But one as lunch would be OK.
One pouch of Ambronite has 500 kcal, and the recommended daily intake for a non-active human is 2.000 kcal. The energy value of the orange juice I added is 45 kcal per 100 ml, and the kcal value of coffee is 2 per cup - so could say I had an energy intake of ~1.600 kcal a day. I found this interesting because on a normal day it’s hard to quantify the energy intake, and even with a healthy diet like mine the chance of “over-eating” is possible. I wanted to see, in a controlled environment, how it would be to live under the recommended daily intake value. That’s why I also didn’t mix it with any other ingredients - like cocnut or soy milk, bananas oe berries, or spices like honey and cinnamon. This week I was out cycling, skiing and walking (average of 4,5 km a day), training at home, working and just doing normal daily stuff. During the mornings and afternoons I never felt hungry after a Supermeal Shake, but around 16, 17 o’clock a wee bit of hunger would appear on the first three days. That would get away once the third shake went down, but around 22 o’clock I again got a hungry feeling during the first three days. Well, so much about this - lets jump in to the experiment! Something to keep in mind: Taste is subjective. What I find OK you might find terrible - or delicious. The first Ambronite Supermeal shake. This first one was with 550 ml water only, and it was OK in taste, grainy, thick and in my opinion very neutral in flavour, possible with a light Black Currant and Spinach after-taste. I expected it to taste much worse after reading Matthew’s take on it but was happy that it was for me good enough to get down. It kept the hunger away for the claimed four or five hours and in the afternoon I had my second Ambronite shake - this time mixed with some Orange Juice, which for me improved the taste considerably. In the afternoon I went to the supermarket with the family - to accompany them. I got a bit hungry over there - all the fresh fruits looked very good - but once at home it wasn’t there anymore. I had my third Ambronite sitting at the table while my family ate their delicious dinner, and I drunk the final shake. Later in the evening - I usually eat fruits in the evenings while watching something - I started to get hungry. Once in bed and asleep all was good though. I didn’t wake up starving as one might expect, going to bed slightly hungry. The shakes all went down fine today, I was drinking them rather slowly over the matter of an hour or so, but the evening meal I drunk in a matter of minutes. After the kids were sleeping and we were watching a series I again was getting a slightly hungry feeling, but once in bed I was fast asleep. All three meals went down easily without problems, and again there was a light hunger in the evening. 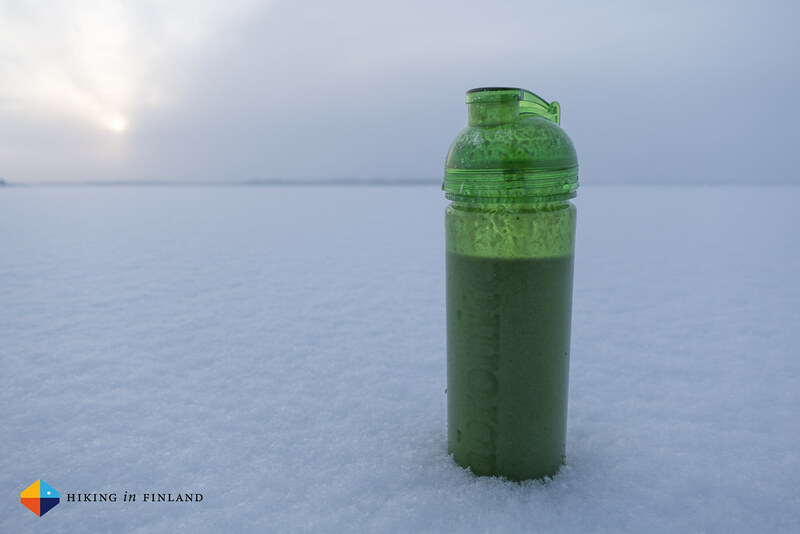 Early breakfast, cycling out to the Baltic to have fun (and shot the above video) and a late Lunch outside - Ambronite didn’t freeze at the -6°C we had, but then I was only two hours outside. Dinner with the family. Surprisingly my body probably must have adjusted to the reduced energy intake, as I didn’t feel hungry at all in the afternoon or evening. You can read the complete list of ingredients here. They are all natural, organic, GMO-free and Vegan, which I find great as it is in line with what I value in my food. The taste thus: It’s really hard to describe this, but neutral, thick (depending on the amount of water you use) and with a light Black Currant and Spinach after-taste would be my take on it. As Ambronite can taste differently between harvests it might be that yours tastes slightly different, too. It is not a taste which I am looking forward to, but more try to get it down as fast as possible - probably an effect of only eating it this week. I am very much looking forward to my first real meal again tomorrow morning. As I say in my video from Day 4, it has shown me that the perceived convenience of these powdery Superfoods is too little for me to give up eating real food. I can see me using it on trips as lunch because of the convenience, but would not use it as a sole source of food - I like my MYOG Müslis and warm evening meals. At home I could see it come in handy on a busy day for lunch, but not just yet =) All in all I was happy to have had the possibility to try this experiment. I thought - reading about Soylent et al. - that this could indeed be the future. And maybe for some it is. But for me it won’t be - certainly not as something that I eat for breakfast, lunch, dinner and a snack every day. There’s a few reasons for that: It’s prohibitive expensive to only eat Ambronite - the cost for a week (if you drink 4 meals a day) would be 226,95€, which would run up to 907,90€ a month (for 120 meals). That’s for one person, in a family of three that’s a ridiculous amount of money - plus I doubt my four year old son would drink this. As a family we spent between 600 and 800€ a month on high-quality food (lots of veggies and fruits, mostly organic & local if possible), which is quite a bit less than what it would cost to feed one person just on Ambronite. Another reason is that I do like real food. I like to cook (on trips in a bag), I don’t mind the shopping too much and the dishwasher does most of the cleaning. It’s also the social aspect of sitting together and eating something tasty. Or going to a Café on the weekend to eat some tasty waffles or a piece of cake. Going to a restaurant with friends & family. Even as I was single I was cooking every day, often having friends over for dinner. The idea that everyone is just sitting there with a shake and trying to get it down - well, it feels a bit boring. 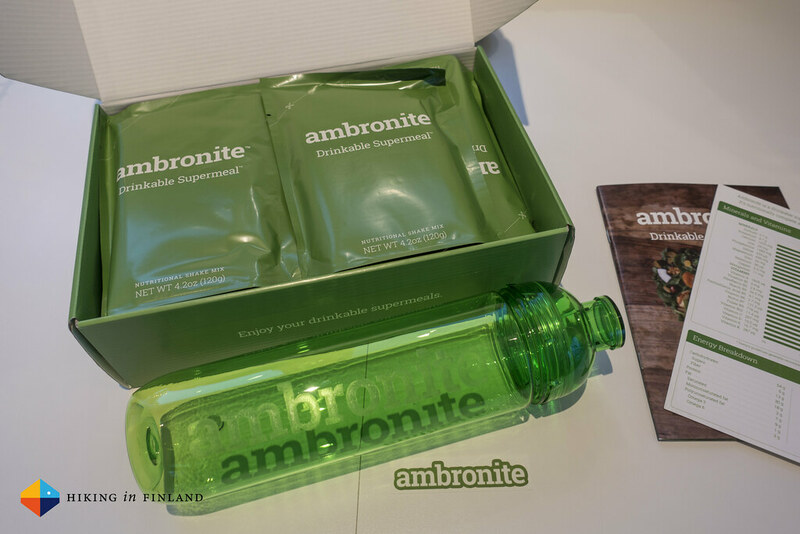 Finally, you can try Ambronite for free - enter your details and use the code “GETSAMPLE” and you’ll get one free Ambronite pouch sent to your door step. If you like it and want to order more, you can use the Coupon Code “HIKINGINFINLAND” and get 20€ off your order. Disclaimer: Ambronite sent me two boxes for free for this experiment, no strings attached & no money involved. If you want to live only of Superfoods - use Common Sense and consult a specialist doctor first.